Before the March, Istanbul Police Station announced the roads to be closed down. 15.30: Istanbul LGBTI+ Pride Week Committee released their press statement before the March to be begin at 18.00 in Taksim. Committee urged everyone to read the statement in every street of Taksim until 18.00. 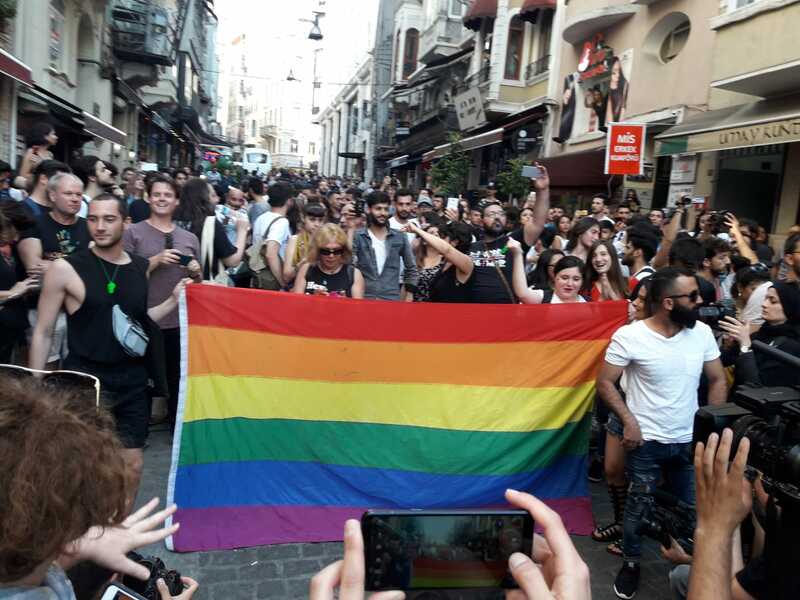 15.50: Pride Committee announced that police forces closed the beginning of Istiklal Avenue and started to close the other streets linked to the Avenue. “We were 5 people. Police said one of our transwoman friend that if we will not go away, they know how to kick us out and they will beat us. Then they forcefully kick us out from the street. They threatened us with the custody and they insulted us. 16.40: Police forces prevented people wearing colorful clothes to enter into Istiklal Avenue. 17.35: Pride Committee told that police attacked a group with plastic bullets in Tarlabaşı. 17.38: The Committee announced that at 18.00 everyone will gather in Mis Street and they will read their statement. 18.20: After the statement, the March continued in side streets. 18.40: Police forces started to attack people marching in side streets with plastic bullets and tear gas. 19.00: After the police attack, another LGBTI group read the statement in Odakule. 19.38: Police attacked people waiting in Mis Street again. They took many people into custody. Then they closed down the street completely. 20.10: Another LGBTI+ group gathered to read the statement near Cihangir. Then police attacked them with police dogs. They took some people into custody here as well. 20.30: During the Pride March, 11 people in total were taken into custody. 01.30: All the participants who were arrested were released.